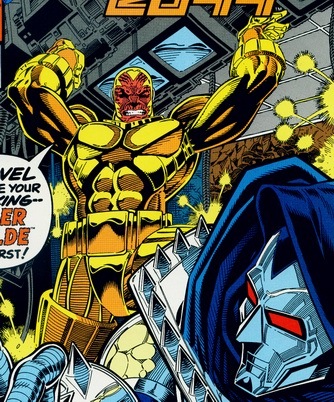 Base of Operations: Gojradia, Latveria, Earth 928 @ 2099 A.D.
Powers/Abilities: Tiger Wylde was a brilliant strategist, and motivated enough to quickly move up the ranks with Alchemax and later conquer Latveria. Rebuilding his body with cybernetics, Tiger Wylde had roughly class 10 strength, and could fire energy blasts from his hands. After his conversion into a full cyborg, he was even stronger. History: (Doom 2099#2-fb) Once the leader of Alchemax's Elite Corps - corporate muscle who forcibly enacted their business takeovers, Tiger Wylde rebuilt his body piece by piece with cybernetic parts. He eventually declared himself an independent and proceeded to take over the weakened Latveria. (Marvel Comics Presents#118/4 (fb) - BTS/Doom 2099#1 (fb) - BTS) Tiger Wylde survived yet another attempt on his life by Alchemax, still angered that he had left the corporation years ago. (Marvel Comics Presents#118/4 - Doom 2099#1) Rubbing it in, Tiger Wylde gloated that Alchemax's assassination attempt failed to Tyler Stone, whom he was talking to over vidphone. Wylde then threatened Stone, telling him that if Alchemax wanted war, they would have it, before hanging up on him. As he talked to his advisors, Doom crashed into his office, attacking him. Tiger assumed it was just another Doombot, but after beating him down, he was surprised to see this Doom was human. Noticing that his face was unscarred, Tiger Wylde decided to help what he thought was the fake Doom pull off his masquerade, by burning his face. (Doom 2099#2 (fb) - BTS) Tiger Wylde sent Rook Seven, a fellow former soldier, to Antarctica, where he was to make sure a transport of the alien mineral Tritonium would reach Latveria. (Doom 2099#2) Surprised to hear that a Pixel Corp robot was used in a recent terrorist attack, Tiger Wylde made a call to DeVargas, Pixel's owner. DeVargas assured Tiger that the robot had been stolen by saboteurs, and that he had nothing to do with it. They both agreed their deal for the Tritonium was still in place. Later, Tiger Wylde met with Fortune, his "divinatory consultant" who had secretly sold him out to Doom. Angered at her recent absence in his council, Tiger backhanded her. (Doom 2099#3) Taking time out of his busy schedule, Tiger Wylde personally dealt with some Alchemax spies. Later, Wylde met with DeVargas, and assured him that Doom was nothing but a distraction that would be dealt with swiftly. Tiger then confronted Zone, claiming that he was working with Doom, but Zone showed him that Fortune was the true traitor. Tiger Wylde met with Fortune and threatened her, forcing her to give up Doom's location. (Doom 2099#4) Attacking Doom's base, Tiger injured or killed several of Doom's followers, but Doom was able to lead him into a one on one battle. Wylde easily overpowered Doom, but noticed the Tritonium bomb placed in the room too late, as it blew up in his face. Doom rose from the rubble, triumphant. (Doom 2099#22) In Margaretta Von Geisterstadt's castle, Tiger Wylde was revived, now in a fully robotic body. (Doom 2099#24) Grabbing onto Doom's floating city, Valhalla, Tiger Wylde was carried with it to Margaretta Von Geisterstadt's castle. Unfortunately, Tiger Wylde was hit by a blast during the firefight between the two forces. Later, Tiger Wylde attacked Doom while he was conversing with Margaretta. Even with only one arm, Tiger held his own, but Doom was able to lure him into a time platform. Doom opened a portal on Tiger Wylde, then, after it had already taken much of his body, closed it, leaving only his head. Marvel Comics Presents#118/4 showed a preview of the first 8 pages of Doom 2099#1. Since it came out a month earlier than the Doom issue, it is considered Tiger Wylde's first appearance. If Tiger Wylde wasn't destroyed by being split in half by the time portal, he was probably blown up along with the rest of Margaretta's castle by Doom. A soldier who fought alongside Tiger Wylde in several multinational wars, Rook Seven was hired by Tiger Wylde to make sure a transport of Tritonium reached Latveria from Antarctica. Rook Seven battled Doom on the flight back to Latveria, but found he was no match for Doom, who was able to toss him out of the plane as it burst into flame. He had a large seven tattooed or scarred onto his forehead. Tiger Wylde's most trusted advisor, Zone was often sceptical of Fortune's "divinatory council." After Doom's terrorist attack on Latveria's Ministry of Defense, Zone was the one who told Tiger Wylde about the use of a Pixel robot. When Tiger Wylde claimed he was the traitor, Zone showed Tiger proof that Fortune was the one who sold him out to Doom. 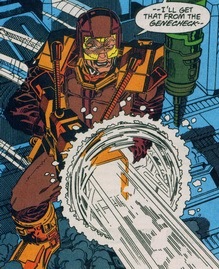 While Tiger Wylde went off to challenge Doom, Zone pointed a gun at Fortune, planning to kill her. Unfortunately for him, Doom's agent, Poet, shot him first.